Not to be confused with Conservative liberalism or Libertarian conservatism. This article is about the political philosophy. For the Canadian political party, see Liberal-Conservative Party. Liberal conservatism incorporates the classical liberal view of minimal government intervention in the economy, according to which individuals should be free to participate in the market and generate wealth without government interference. However, individuals cannot be thoroughly depended on to act responsibly in other spheres of life, therefore liberal conservatives believe that a strong state is necessary to ensure law and order and social institutions are needed to nurture a sense of duty and responsibility to the nation. They also support civil liberties, along with some social conservative positions. In Europe liberal conservatism is the dominant form of contemporary conservatism and centre-right politics. As both "conservatism" and "liberalism" have had different meanings over time and across countries, the term "liberal conservatism" has been used in quite different ways. It usually contrasts with "aristocratic conservatism", which deems the principle of equality as something discordant with human nature and emphasizes instead the idea of natural inequality. As conservatives in democratic countries have embraced typical liberal institutions such as the rule of law, private property, the market economy and constitutional representative government, the liberal element of liberal conservatism became consensual among conservatives. In some countries (e.g. the United Kingdom and the United States), the term "liberal conservatism" came to be understood simply as "conservatism" in popular culture, prompting some conservatives who embraced more strongly classical liberal values to call themselves "libertarians" instead (see also right-libertarianism). 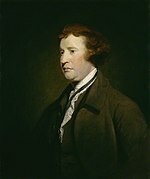 Nevertheless, in the United States conservatives often combine the economic individualism of classical liberals with a Burkean form of conservatism that emphasizes the natural inequalities between men, the irrationality of human behavior as the basis for the human drive for order and stability and the rejection of natural rights as the basis for government. However, from a different perspective, American conservatism (a "hybrid of conservatism and classical liberalism") has exalted three tenets of Burkean conservatism, namely the diffidence toward the power of the state, the preference of liberty over equality, and patriotism while rejecting the three remaining tenets, namely loyalty to traditional institutions and hierarchies, scepticism regarding progress and elitism. Consequently, in the United States the term "liberal conservatism" is not used. American "modern liberalism" happens to be quite different from European liberalism and occupies the centre-left of the political spectrum, in contrast to many European countries where liberalism is often more associated with the centre-right and social democracy makes up a substantial part of the centre-left. The opposite is true in Latin America, where economically liberal conservatism is often labelled under the rubric of neoliberalism both in popular culture and academic discourse. For their part, in their embracement of liberal and free market principles, European liberal conservatives are clearly distinguishable from those holding national conservative, fully social-conservative and/or outright populist views, let alone a right-wing populist posture. Being liberal often involves stressing free market economics and the belief in individual responsibility together with the defense of civil rights and support for a limited welfare state. Compared to other centre-right political traditions, such as Christian democracy, liberal conservatives are less traditionalist and more economically liberal, favouring low taxes and minimal state intervention in the economy. In much of central and northwestern Europe, especially in Germanic and traditionally Protestant countries, as well as the United Kingdom and Belgium, a divide persists between liberal conservatives (including Christian democrats) and liberals (including conservative liberals and social liberals). In most Nordic countries, liberal conservatives, Christian democrats and liberals form distinct political families and have each their own party. In most countries where Romance languages are spoken and where Catholicism is or has been dominant, as well as in Greece, liberal conservative movements, often encompassing Christian democrats and liberals, have more recently gained traction and the terms "conservative" and "liberal" may be understood as synonymous. Consequently, at the European level, Christian democrats and most liberal conservatives are affiliated to the European People's Party (EPP), while liberals (including conservative and social liberals) to the Alliance of Liberals and Democrats for Europe Party (ALDE Party). In this context, some traditionally Christian-democratic parties (such as Christian-Democratic and Flemish in Belgium, the Christian Democratic Appeal in the Netherlands, the Christian Democratic Union in Germany and the People's Party in Austria) have become almost undistinguishable from other liberal-conservative parties. On the other hand, newer liberal-conservative parties (such as New Democracy in Greece, the Social Democratic Party in Portugal, People's Party in Spain, Forza Italia / The People of Freedom / Forza Italia in Italy, the Union for a Popular Movement / The Republicans in France and most centre-right parties from countries once belonging to the Eastern Bloc and Yugoslavia) have not adopted traditional labels, but their ideologies are also a mixture of conservatism, Christian democracy and liberalism. In the modern European discourse, "liberal conservatism" usually encompasses centre-right political outlooks that reject at least to some extent social conservatism. This position is also associated with support for moderate forms of social safety net and environmentalism (see also green conservatism and green liberalism). This variety of "liberal conservatism" has been espoused by Nordic conservatives (the Moderate Party in Sweden, the Conservative Party in Norway and the National Coalition Party in Finland), which have been fending off competition from right-wing populists to their right and do not include Christian democrats, and, at times, the British Conservative Party. In an interview shortly after taking office as Prime Minister in 2010, David Cameron introduced himself a "liberal conservative". During his first speech to a party conference in 2006, Cameron had defined this as believing in individual freedom and human rights, but being skeptical of "grand schemes to remake the world". Historically, in the 18th and 19th centuries "conservatism" comprised a set of principles based on concern for established tradition, respect for authority and religious values. This form of traditionalist or classical conservatism is often considered to be exemplified by the writings of Joseph de Maistre in the post-Enlightenment age. Contemporaneous "liberalism" – now recalled as classical liberalism – advocated both political freedom for individuals and a free market in the economic sphere. Ideas of this sort were promulgated by John Locke, Montesquieu, Adam Smith, Jeremy Bentham and John Stuart Mill, who are respectively remembered as the fathers of classical liberalism, the separation of church and state, economic liberalism, utilitarianism and social liberalism. According to scholar Andrew Vincent, the maxim of liberal conservatism is "economics is prior to politics". 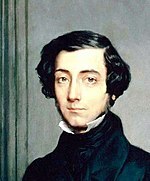 Others emphasize the openness of historical change and a suspicion of tyrannical majorities behind the hailing of individual liberties and traditional virtues, by authors such as Edmund Burke and Alexis de Tocqueville, as the basis of current liberal conservatism, as seen both in the works of Raymond Aron and Michael Oakeshott. However, there is general agreement that the original liberal conservatives were those who combined conservative social attitudes with an economically liberal outlook, adapting a previous aristocratic understanding of natural inequalities between men to the rule of meritocracy – without directly criticizing privileges of birth as long as individual liberties were guaranteed. Over time, the majority of conservatives in the Western world came to adopt free market economic ideas as the Industrial Revolution progressed and the aristocracy lost its power, to the extent that such ideas are now generally considered as part of conservatism. Nonetheless, in most countries the term "liberal" is used to describe those with free market economic views. This is the case, for example, in continental Europe, Australia and Latin America. Ukraine: Petro Poroshenko Bloc, All-Ukrainian Union "Fatherland"
^ Nordsieck, Wolfram. "Parties and Elections in Europe". ^ Johnston 2007, p. 155. ^ Grigsby, Ellen: Analyzing Politics: An Introduction to Political Science. Cengage Learning, 2011. ^ Wooldridge, Adrian; Micklethwait, John (2011). The Right Nation: Why America is Different. Penguin Books Limited. ISBN 9780241958896 – via Google Books. ^ Bethell, Leslie: The Cambridge History of Latin America: Latin America since 1930. Cambridge University Press, 1991. ^ Cameron, David (2010-05-16). "I am a Liberal Conservative". BBC. Retrieved 18 August 2012. ^ Vincent, Andrew (2009). "Conservatism". Modern Political Ideologies. Chichester, U.K. Malden, MA: Wiley-Blackwell. pp. 65–66. ISBN 978-1-4051-5495-6. ^ Slomp, Hans (2011-09-26). Europe, a Political Profile: An American Companion to European Politics - Hans Slomp - Google Books. pp. 106–108. ISBN 9780313391828. ^ Goldfarb, Michael (20 July 2010). "Liberal? Are we talking about the same thing?". BBC News. Retrieved 6 July 2016. ^ MacLean, James. ""The Two Meanings of "Liberalism"". Retrieved 6 July 2016. ^ Nicole A. Thomas; Tobias Loetscher; Danielle Clode; Michael E. R. Nicholls (May 2, 2012). "Right-Wing Politicians Prefer the Emotional Left". PLOS ONE. 7 (5): 4. Bibcode:2012PLoSO...736552T. doi:10.1371/journal.pone.0036552. PMC 3342249. PMID 22567166. The Liberal Party of Australia has an ideology in line with liberal conservatism and is therefore right of centre. ^ Janusz Bugajski (2002). Political Parties of Eastern Europe: A Guide to Politics in the Post-Communist Era. M.E. Sharpe. p. 22. ISBN 978-1-56324-676-0. ^ a b Paul Lewis (2002). Political Parties in Post-Communist Eastern Europe. Routledge. p. 53. ISBN 978-1-134-63437-8. ^ John Nagle; Alison Mahr (1999). Democracy and Democratization: Post-Communist Europe in Comparative Perspective. SAGE Publications. p. 188. ISBN 978-0-7619-5679-2. ^ a b c d e f Elizabeth Bakke (2010). "Central and Eastern European party systems since 1989". In Sabrina P. Ramet. Central and Southeast European Politics since 1989. Cambridge University Press. p. 78. ISBN 978-1-139-48750-4. ^ Maciej Stobinski (2014). "Twenty years of the Czech party system: 1992–2011". In Lucyna Czechowska; Krzysztof Olszewski. Central Europe on the Threshold of the 21st Century: Interdisciplinary Perspectives on Challenges in Politics and Society. Cambridge Scholars Publishing. p. 296. ISBN 978-1-4438-6483-1. ^ Otto Eibl; Michal Pink (2016). "Election Results, Candidate Lists and the Framing of Campaigns". In Ruxandra Boicu; Silvia Branea; Adriana Stefanel. Political Communication and European Parliamentary Elections in Times of Crisis: Perspectives from Central and South-Eastern Europe. Palgrave Macmillan UK. p. 258. ISBN 978-1-137-58591-2. ^ "BEDNÁŘ: Svobodní jsou šancí pro zklamané pravicové voliče | Svobodní - Strana svobodných občanů". web.svobodni.cz (in Czech). 2012-04-07. Retrieved 27 March 2017. ^ "Realisté představili posilu. Jako lídr Parbubického kraje přišel Alexander Tomský". Parlamentní Listy. Retrieved 7 August 2017. ^ Mads Dagnis Jensen (2015). "The Nordic Countries and the European Parliament". In Caroline Howard Grøn; Peter Nedergaard; Anders Wivel. The Nordic Countries and the European Union: Still the Other European Community?. Routledge. p. 89. ISBN 978-1-317-53661-1. ^ José María Magone (2003). The Politics of Southern Europe: Integration Into the European Union. Greenwood Publishing Group. p. 148. ISBN 978-0-275-97787-0. ^ Christina Bergqvist (1999). Equal Democracies? : Gender and Politics in the Nordic Countries. Nordic Council of Ministers. p. 319. ISBN 978-82-00-12799-4. ^ Kerstin Hamann; John Kelly (2010). Parties, Elections, and Policy Reforms in Western Europe: Voting for Social Pacts. Routledge. p. 1980. ISBN 978-1-136-94986-9. ^ Janusz Bugajski (2002). Political Parties of Eastern Europe: A Guide to Politics in the Post-Communist Era. M.E. Sharpe. p. 141. ISBN 978-1-56324-676-0. ^ Arco Timmermans; Edwin van Rooyen; Gerrit Voerman (26 November 2014). "Policy analysis and political party think tanks". In Frans van Nispen; Peter Scholten. Policy analysis in the Netherlands. Policy Press. p. 189. ISBN 978-1-4473-1333-5. ^ Liubomir K. Topaloff (2012). Political Parties and Euroscepticism. Springer. p. 21. ISBN 978-1-137-00968-5. ^ José M. Magone (2017). The Statecraft of Consensus Democracies in a Turbulent World: A Comparative Study of Austria, Belgium, Luxembourg, the Netherlands and Switzerland. Taylor & Francis. p. 112. ISBN 978-1-315-40785-2. ^ Jean-Michel De Waele; Anna Pacześniak (2011). "The Europeanisation of Poland's political parties and party system". In Erol Külahci. Europeanisation and Party Politics. ECPR Press. p. 131. ^ André Krouwel (2012). Party Transformations in European Democracies. SUNY Press. p. 348. ISBN 978-1-4384-4483-3. ^ "2016 Russia legislative elections: State Duma". Parties and Elections in Europe. 2016. Retrieved 30 December 2017. ^ Alfio Cerami (2006). Social Policy in Central and Eastern Europe: The Emergence of a New European Welfare Regime. LIT Verlag Münster. pp. 29–. ISBN 978-3-8258-9699-7. ^ Peter Viggo Jakobsen (2006). Nordic Approaches to Peace Operations: A New Model in the Making?. Taylor & Francis. pp. 184–. ISBN 978-0-415-38360-8. ^ Hariz Halilovich (2013). Places of Pain: Forced Displacement, Popular Memory and Trans-local Identities in Bosnian War-torn Communities. Berghahn Books. p. 208. ISBN 978-0-85745-777-6. ^ "Liberální strana". liberalove.bluefile.cz (in Czech). Retrieved 27 March 2017. ^ "Unie svobody – zoufalé hledání identity". www.witzany.cz. Retrieved 27 March 2017. ^ David Hanley (1999). "France: Living with Instability". In David Broughton. Changing Party Systems in Western Europe. Continuum International Publishing Group. p. 66. ISBN 978-1-85567-328-1. Retrieved 21 August 2012. ^ Alistair Cole (2003). "Stress, strain and stability in the French party system". In Jocelyn Evans. The French Party System. Manchester University Press. p. 12. ISBN 978-0-7190-6120-2. ^ Ruth Wodak; John E. Richardson (2013). Analysing Fascist Discourse: European Fascism in Talk and Text. Routledge. p. 43. ISBN 978-0-415-89919-2. ^ Ilaria Riccioni; Ramono Bongelli; Andrzej Zuczkwoski (2013). "The communication of certainty and uncertainty in Italian political media discourses". In Anita Fetzer. The Pragmatics of Political Discourse: Explorations across cultures. John Benjamins Publishing Company. p. 131. ISBN 978-90-272-7239-3. ^ Pallaver, Günther (2008). Jens Woelk; Francesco Palermo; Joseph Marko, eds. South Tyrol's Consociational Democracy: Between Political Claim and Social Reality. Tolerance Through Law: Self Governance and Group Rights In South Tyrol. Martinus Nijhoff Publishers. p. 309. ISBN 978-90-04-16302-7. ^ Aleks Szczerbiak (2006). "The Polish centre-right's (last?) best hope: The rise and fall of Solidarity Electoral Action". In Aleks Szczerbiak; Seán Hanley. Centre-right Parties in Post-communist East-Central Europe. Psychology Press. p. 66. ISBN 978-0-415-34781-5. McAnulla, Stuart (2006). British Politics: A Critical Introduction. A&C Black. ISBN 978-0-826-46155-1. Johnston, Larry (2007). Politics: An Introduction to the Modern Democratic State. University of Toronto Press. ISBN 978-1-4426-0040-9. Johnston, Larry (2011). Politics: An Introduction to the Modern Democratic State. University of Toronto Press. ISBN 978-1-4426-0533-6.